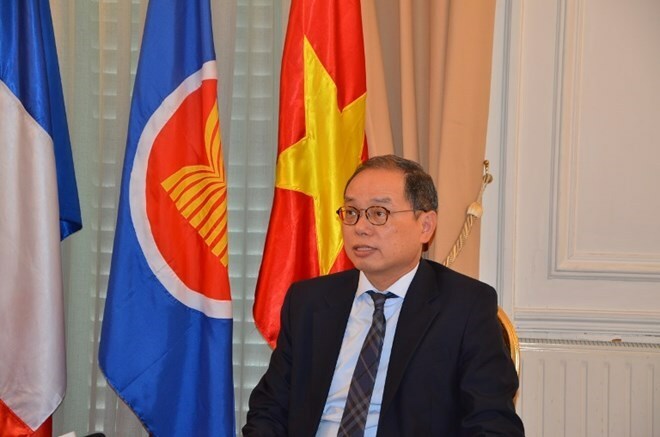 Paris (VNA) – Vietnam successfully fulfilled its role as rotational Chairman of the ASEAN Committee in Paris (ACP) from April to July, according to Vietnamese Ambassador to France Nguyen Ngoc Son. The diplomat, who chaired the group of the ASEAN ambassadors to France over the last four months, told Vietnam News Agency that the Vietnamese Embassy in France was proactive in reinforcing ASEAN’s relations with France. The embassy stepped up the ACP’s links with France through meetings with local Government members, parliamentarians, scholars and businesses, including French Minister for Europe and Foreign Affairs Jean-Yves Le Drian, Chairman of the French Senate’s Committee on Foreign Relations, Defence and Armed Forces Jean Pierre Raffarin, Executive Chairman of the French Institute of International Relations Thierry de Montbrial and executives of the EDF electricity group and Airbus. The Vietnamese Embassy also chaired and participated in events like the ASEAN Family Day so as to boost mutual understanding and solidarity among the staff of the ASEAN countries’ embassies in Paris, Son said. He noted his embassy chaired the ACP amid France’s presidential and legislative elections, along with preparations for marking the 50th founding anniversary of ASEAN such as the anniversary celebration, a workshop on ASEAN’s economy and an ASEAN film week in Paris. With those positive outcomes, ASEAN diplomats lauded Vietnam’s chairmanship of the ACP, Ambassador Son added. He said the Vietnamese Embassy will continue coordinating with the next ACP Chairman, the Bruneian Embassy, as well as other ACP members to organise celebrations for ASEAN’s 50th founding anniversary and other activities, thus popularising ASEAN in France. Son noted that through meetings with French officials, he realised the foreign policy of the new administration in France towards Southeast Asia basically follows the orientations set by the previous government. It continues to prioritise enhancing France’s relations with the region and ASEAN member nations. France wishes to strengthen economic ties with ASEAN to make use of the region’s common market and grasp opportunities generated by the formation of ASEAN’s free trade areas with major partners such as China, Japan, the Republic of Korea, India, Australia and New Zealand, along with the Regional Comprehensive Economic Partnership. The EU nation will support its private sector and small- and medium-sized enterprises to do business in ASEAN in fields such as technology, digitalisation, environment, infrastructure and manufacturing, the Vietnamese diplomat said. It also support the bloc’s efforts to ensure peace, stability and cooperation and to build a regional security architecture, he noted, adding that France will increase its presence in the East Sea and promote respect for the right to navigation and aviation freedom in the region. For Vietnam, French leaders have often affirmed willingness to intensify the two countries’ strategic partnership to meet both sides’ interests and bring more cooperation opportunities.